To many, St. Patrick’s Day is a day to honor one of Ireland’s foremost patron saints, St. Patrick, as well as a day to celebrate all things Irish. For me, it is also a celebration of the arrival of Spring…rainbows, green grass, clover, shamrocks, freshness and awakening. And after a long dreary Winter, we could all use a good dose of Springtime! 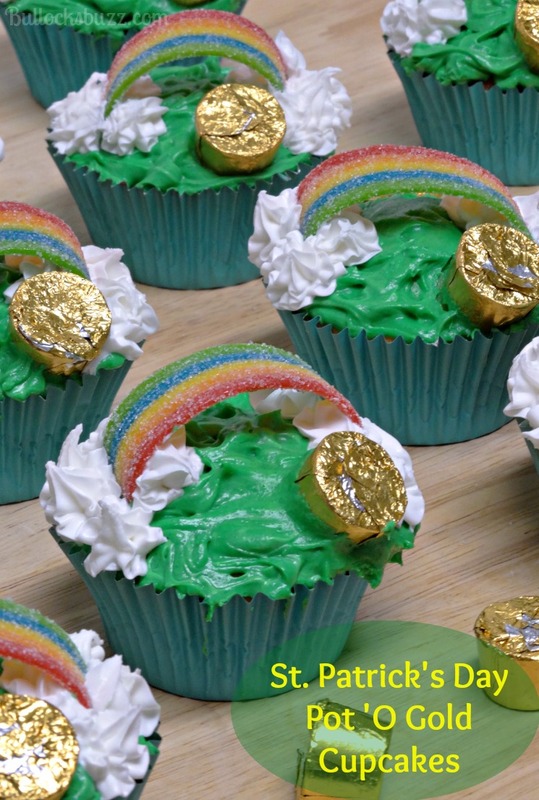 What better way to celebrate the arrival of spring than making a batch of fun and delicious St. Patrick’s Day Pot ‘O Gold Cupcakes! Legend holds that leprechauns hide their gold in a pot at the end of the rainbow. Gather the kids around and bring this legend to life with the adorable and delicious cupcakes! All you need is a few easy-to-find ingredients, and a bit of time to bake and decorate, and you’ve got yourself a batch of adorable St. Patty’s Day cupcakes! 3. Add eggs one at a time, beating after each addition. 5. In a separate bowl combine the remaining dry ingredients and mix well. 6. Add the dry mix to the butter mixture, making sure to mix well. 7. Add the milk, mixing until the batter forms. 8. Place in preheated oven for 18 – 24 minutes. 9. Remove and allow to cool completely before decorating. 1. 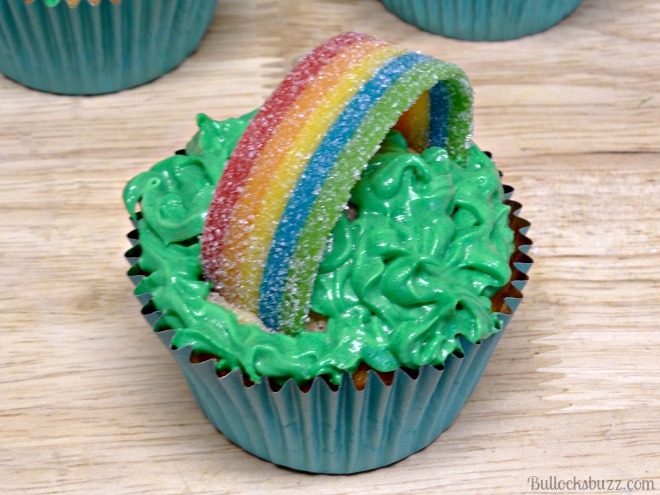 Begin by making the rainbow by forming the rainbow sour candy strips into an arch and sticking the ends into the cupcake.  I cut my strips into about 6″ long pieces as I found the shorter they are, the better they stand up. 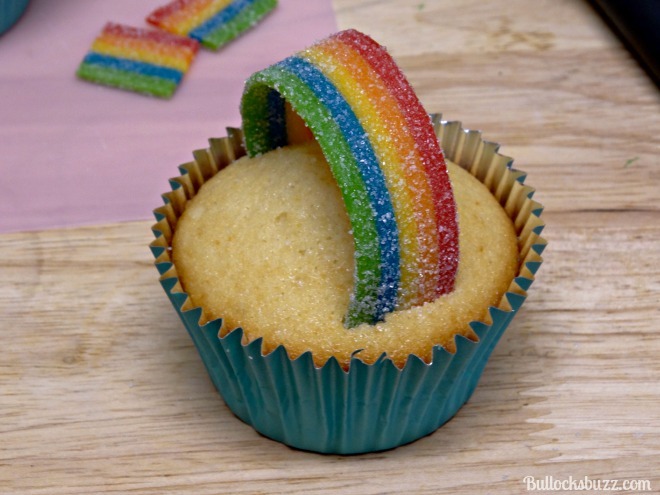 I then used a knife to make a slit in the top of the cupcake where I wanted the rainbow candy to go – it made it much easier to insert it into the cupcake! I also recommend adding the rainbows no more than 2 hours before serving, or they will start to droop and lose their shape. 2. 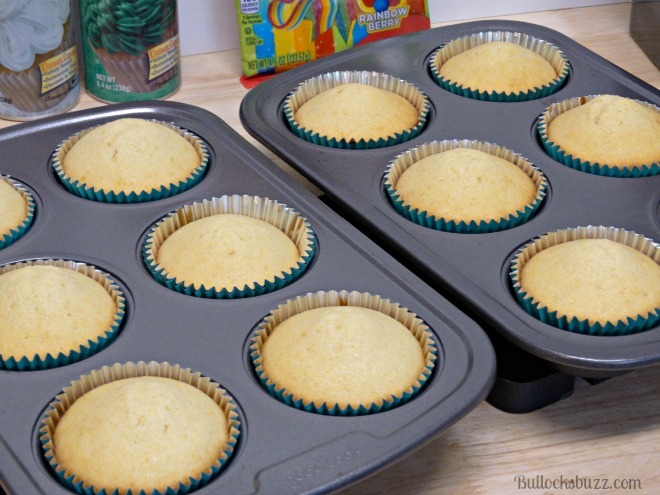 Next, cover the cupcake tops using the green cupcake icing and working around the rainbows. If you have the time and an extra-creative urge, use the decorative piping tip that gives you the look of grass. 3. 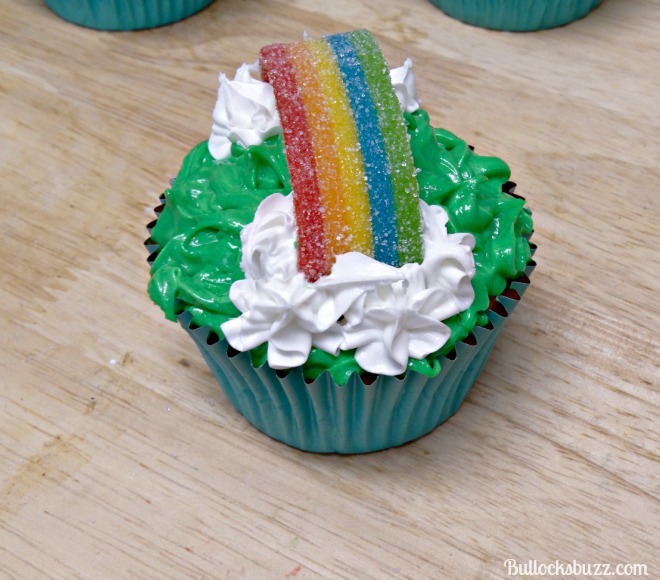 Now use the white icing to add the clouds on each side of the rainbow. 4. Last, but not least, insert the “pot of gold” into the ‘grass’ at one end of the rainbow. Make a bunch of these cupcakes and share. 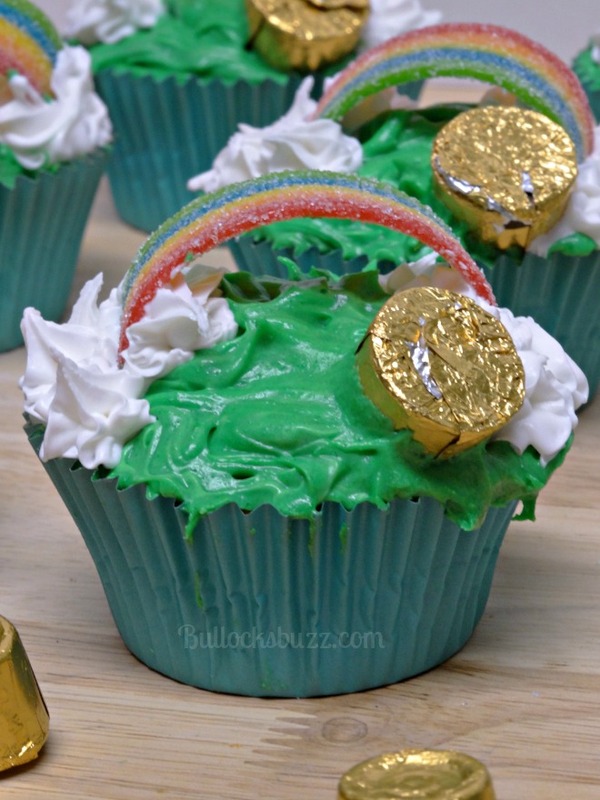 Like so many things in life, these St. Patrick’s Day Pot ‘O Gold Cupcakes are so much better when shared with those you love! Happy St. Patrick’s Day! How is your family celebrating St. Patrick’s Day this year?